There is a picture by Marwan that, as in a matrix, contains all the pictures he has made since then. It hangs in a wonderful exhibition set up for the painter by the Berlinische Galerie, which has cultivated his work in exemplary fashion for years: "Khaddousch or the Unknown Early Work". The picture has a fitting title; it is called "Untitled" and was created in 1964, the time when Marwan had completed his studies in Berlin and stood in close contact there with the cohort of a young, rising generation of painters whose existential desire to express and pandemoniac furor teutonicus radiated an equally strange and lasting effect on the poetic Arabic painter. 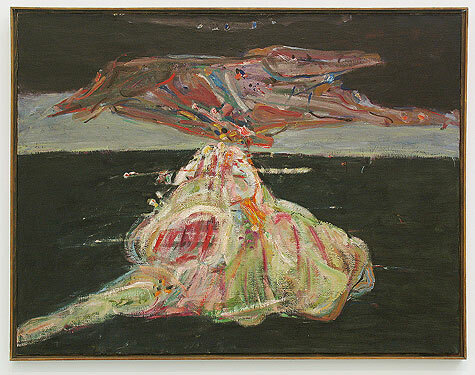 Marwan had studied under Hann Trier at the Hochschule für Bildende Künste, in the center of German Informal Painting. And then, with his own work, he entered the center of a new figuration that rediscovered expressive-convulsive beauty and that molded Marwan in his own way, which combines the Western and his homeland’s Oriental culture. He has not left this center to this day; all of this is still preserved in the heads and portraits, these facial landscapes that often burst apart the pictures’ formats. Even for those who think they know Marwan’s oeuvre, this exhibition is a discovery. It shows not only paintings, but also and especially drawings and watercolors: self-portraits, pictures of people, a few landscapes, and free compositions that bring the subjects into magical, dreamlike connections. Marwan, the Syrian in politically and climatologically cold Berlin, the literarily, poetically, and poetologically learned color-magician, who knows the light of the south better than his colleagues, the material from which most of the beauties of the world are still woven, discovered – in a picture without title, painting with egg tempera and oils in 1964 – darkness and dichotomy and apparently his own artistic goal. In the figurative pictures from Marwan’s early period in Berlin, this melancholy of lived or dreamed moments is omnipresent – also and precisely when they show delicately or fleetingly touching body contact, they are partings, rather than arrivals. The vitalism of his generation has remained alien to him; his concept of solitude was always a consensual one. His self is his self, in contradiction to Rimbaud's famous dictum 'I is another', which raised modernism’s central question of the identity of the subject. The aforementioned untitled picture shows two beings in a metaphysical space. One could interpret them as animals placed in black night, the one resting affably, the other threateningly baring its fangs, but this doesn’t take us any further. Nor does any reference to the art-historical anchoring of the painterly sensations of raw meat, that phosphorescent butcher’s interior that we know from Rembrandt and Soutine – they, too, painters of illumination. It is rather, as Marwan himself has noted, a phenomenon of mirroring on a horizontal axis, but one that is also literally a horizon, with something in front of it and something beyond it, things we would have no inkling of if it weren’t for the painter and his painting. One of those wonderful, succinct, painful poems that Giuseppe Ungaretti wrote in his early years could provide a key. It is called "Discord": "With my wolf’s hunger / I retract / my sheep body. / I am / like the wretched little ship / and like the drunken sea." Ungaretti, who spent his childhood in Egypt, was the poet of the autobiographical. Marwan is its painter. I don’t write this solely because one could interpret the long chain of heads, facial landscapes with and without mirroring and unveiling horizons, as work on the one, unattainable self-portrait, but above all because Marwan’s theme is being at one in alien surroundings. And his own site in it: ship and sea. The long alienness of a different culture that has become even more alien with the events of the most recent time. Its painterly metaphor is darkness, to which he set off on his journey more than 40 years ago, as Captain Marlow once did into the Heart of Darkness. But Marwan’s darkness is not sinister gloom. Only after Marwan had found the darkness could the light in the picture itself appear and develop corporeality and dimension out of its innermost depths. And so Marwan’s darkness does not hold Marlowe’s horror, but rather the essence of the latter’s experience: something molding one for life. The insight that Joseph Conrad places in his figure’s mouth is what the yearning mouths in Marwan’s heads seem to want to express: "We live as we dream. Alone." Freelance art historian, curator and author. Lives in Berlin, Germany.